This is my very first e-book review, I normally don't do book or e-book review but something in this book has captured my attention. It might be the title and the book cover or due to the fact that my 7 yr old son loves dogs so much. He in fact have two stuffed dogs he named Spot and Chase and treat them like real dogs. He asked me many times if I could buy them dog food. I just chuckled and explained to him that his special dogs does not eat and never go hungry. So, I signed up for this promotion and I received a free e-book copy of this in exchange of our honest opinion. 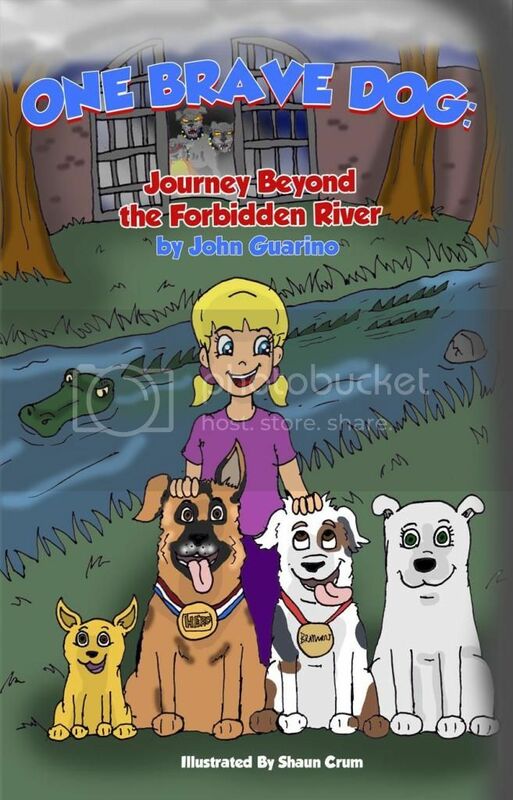 One Brave Dog: Journey Beyond The Forbidden River was written by John Guarino and illustrated by Shaun Crum. Can one brave dog defeat a vicious gang of wild and evil dogs?? Or in another words, can a young, just a puppy be brave enough to defeat wild dogs to save the person he loves? This is a story of love conquers all. When fears and circumstances discourage or hinder you to continue on your journey to save your beloved, here comes love... will guide you and help you conquer it all. PD(Puppy Dog) has to conquer all his fears to find his missing beloved Granpa Angelo, a war hero veteran dog. In his heart he believes that his grandpa is still alive and was taken away by the vicious pack of wild dogs led by an evil, scary dog named Diablo beyond the forbidden river. But PD is not travelling alone, his grandpa's friend Chewy, a spanish speaking Chihuahua joined him on his quest. There were many challenges along the way, there's this Witchy Woman, gator and the unforgiving river, a three-headed fire breathing monster and Diablo with his gang that they have to overcome..but at the end PD conquered it all and saved his grandpa. This book is packed with action, adventure, love story, comedy and horror. The book will teach young readers the value of team work, love, respect, and bravery. My son and I enjoyed reading this book, a great bonding time when we were reading together. The illustrations was good but I hope they will add more pictures. I think with additional illustrations, It will help young readers to visualized the story. Over all, the story is excellent. Dog lover or not you will love this book. If you want your very own copy of this e-book, you can purchase it through Amazon. Just copy and paste the link below. Disclosure: I received a copy of this e-book for FREE for product evaluation and review purposes, however all opinions expressed were exclusively mine and my family and not influenced in anyway.